Imagine a valedictorian puts up the most intimidating numbers in his school’s history. He takes the hardest classes his school offers – math, sciences, humanities, everything – and he finishes with a 97/100 composite average. The second best composite average ever was a 93/100 by someone 20 years ago in a time when grades were inflated more than today. But in the rising junior class, two classes below that of Mr. 97, three absolute studs, boasting 95/100, 92/100, and 90/100 averages, compete with each other. None of their trophy chests are as cluttered as Mr. 97’s because only one of the three can ever win awards. In addition, because classes are graded on a curve and these three compete with each other, they are at a significant disadvantage in regards to inching up their cumulative averages. Most notably, Mr. 95 and Mr. 97 have taken ten courses with one another – Mr. 95 annihilated Mr. 97 in every math class they took together, and they tied in all the non-math classes. Is Mr. 97 still the smartest student in the history of the school? Does having the most complete resume make him the most legit? Now substitute Roger Federer for Mr. 97, Rafael Nadal for Mr. 95, Novak Djokovic for Mr. 92, and Andy Murray for Mr. 90. In sports, “greatness” and Greatest of All Time (GOAT) are impossible to define. There is no regression or index that could possibly spit out one’s ‘greatness ranking’ because people would constantly bicker over what variables to include (championships, best seasons, consistency, individual success, team success, etc.) and how they’re weighted. Given the above, you’d need an extremely strange index to rank Blaine Gabbert ahead of Peyton Manning. Or Andy Roddick ahead of Roger Federer. Or anyone to ever pick up a hockey stick over Wayne Gretzky. Even without the benefits of math determining margin calls, ‘objectively better’ can exist when one’s prowess compared to his counterpart(s) is so lopsided that it transcends subjectivity. For the GOAT, these ‘counterparts’ encompass everyone who has ever walked the earth. 1.) With 17 grand slam titles to his name, he has won over 20% more than Pete Sampras (14 titles), the previous holder of tennis’ most coveted record. He has won all four majors, and, for three of the four, he shares the record for most wins – Wimbledon (7), US Open (5), and Australian Open (4). In addition, at 24, he has the highest number of grand slam finals appearances. 2.) 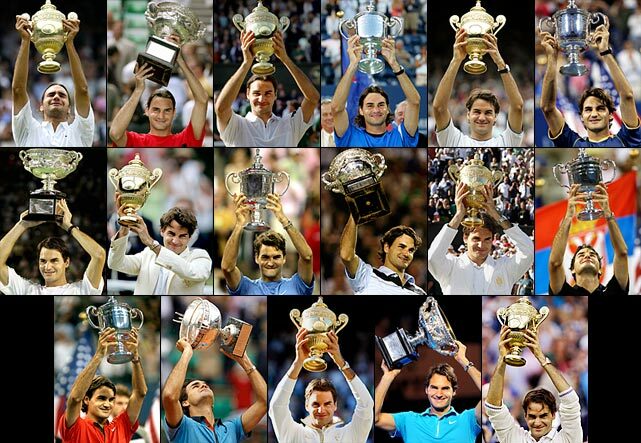 He holds the record for consecutive grand slam finals (10), semifinals (23), and quarterfinals (36). 3.) He has been ranked number 1 for 302 weeks, more than anyone else ever. If it were not for one scarlet head-to-head, Federer’s GOAT status would be objective. 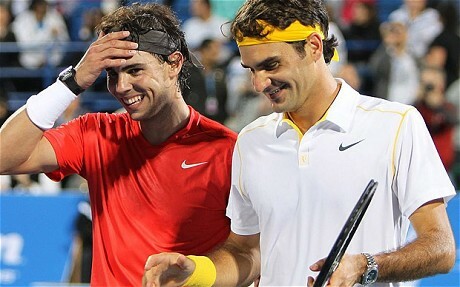 Federer and his rival, Rafael Nadal, have played 32 matches, and Nadal has won 22. How can you be the objective GOAT when you’ve lost twice as many matches as you’ve won against your strongest contemporary? Federer fans concede that Nadal’s prowess on clay is unparalleled. Nadal is 13-2 against Federer on clay, and 9-8 against Federer on other surfaces. But here lies the problem: Clay counts!!! Moreover, in non-French Open grand slam matches, Nadal edges Federer 3-2, and their overall grand slam record is 8-2 in Nadal’s favor. 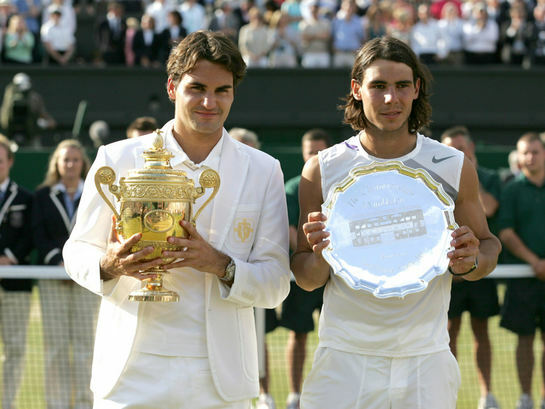 Even during 2004-2007, the pinnacle of Federer’s dominance, he was 6-8 versus Nadal. Federer fans fear Nadal on the other side of the net because Nadal has owned Federer! From this blemish stems questions disastrous to Federer’s GOAT status. 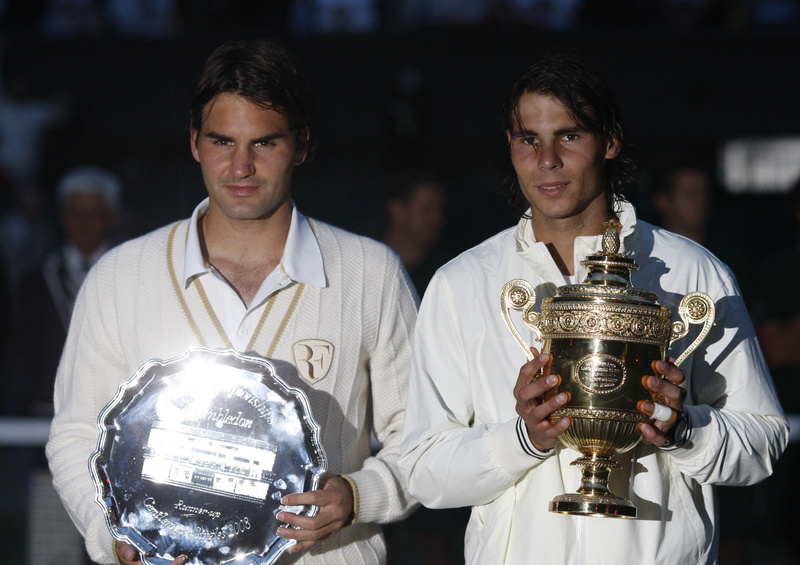 Federer won his first 12 grand slams before Nadal turned 22 years-old – before Nadal was a multi-surface threat. Prior to Nadal, Federer had no worthy adversary. Does this fact underscore Federer’s greatness by showing he was responsible for raising the level of the game’s elite by an unparalleled margin? Or does it mean he was the king of men’s tennis’ Dark Ages? Without Federer as a target, could Nadal have reached Federer’s level? Would Nadal have dominated 2003-2007 as decisively as Federer if he were in his prime and Andy Roddick, Marat Safin, and Lleyton Hewitt were his most formidable competition? 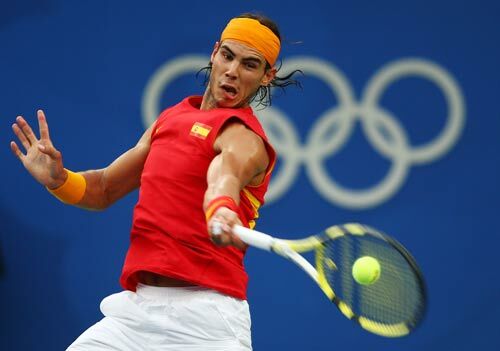 After turning 21 years-old, Nadal was 6-2 against Roddick, 2-0 against Safin, and 5-0 against Hewitt. How much has luck contributed to the extent of Federer’s accolades – is his crowded trophy case more a product of his prowess or the timing of his birth? If Nadal’s and Federer’s birthdays were flipped, could Federer, in his more formative years, have developed an answer to Nadal’s cross-court topspin forehand? At the height of Federer’s powers, was his level of play higher than the level of the game’s current elite? To every one of the questions above, the answer is subjective. What is not subjective is that prior to Nadal’s rise, Federer was the most distant number 1 in the history of the game. For 2003-2007, fans watched the later rounds in grand slams to marvel at Federer. For 2008-2013, fans have watched these same rounds with hopes of witnessing an epic match between two great players. In all, the grand slam and Olympic semifinals or finals during 2008-2013 staged 23 matches that are a tennis fan’s dream. To me, the moment that best encapsulates this time period’s great matches is the 2012 Australian Open’s trophy ceremony; neither Nadal nor Djokovic could stand up, forcing tournament organizers to fetch them chairs. These men have punished balls; painting lines with all the power they could muster. Losers have cried during trophy presentations. Winners have climbed into the stands to give sweaty hugs and kisses to supporters in their boxes. Competitors waged war until they ran out of bullets and explosives, and then they threw rocks instead of running away. Great players forced the caliber of elite play upwards, and when one player inched ahead of the pack the others would will themselves to that new level. Federer fan: Nadal is Federer’s kryptonite. Every superhero has a weakness. In Federer’s case, it is Nadal’s topspin forehand. The fact that Federer has a kryptonite just proves he’s a human, not a robot. To use a basketball analogy, the Pistons were Michael Jordan’s kryptonite until the 1991 NBA season. Since he experienced his kryptonite at the start of his career, he got past it and became the greatest basketball player of his era. Federer didn’t have this opportunity because he is older than Nadal. But you can’t blame him for that. He has a winning record against his three biggest rivals – as well as against every current top-30 player and every major player of his generation – during the highest quality era men’s tennis has ever seen. In addition to Nadal’s 22-10 advantage in his head-to-head with Federer, he’s 22-17 vs. Djokovic and 13-5 vs. Murray, while Federer is a hardly dominant 16-15 vs. Djokovic and a losing 9-11 vs. Murray. So which player has the most consistent A-game? Federer’s GOAT claim is based on his remarkable records. And there is no disputing that they’re remarkable. But worthy competition didn’t exist during the lion’s share of the period he was building his records. Don’t you think Lebron would have 10 titles by now if he were playing in the NCAA, or in China? Quite simply, better statistics are easier to achieve when competition is weaker. Obviously durability plays quite a bit into grand slam total, and I think it’s fair to hold his relatively fragile body against Nadal. However, before Sampras broke his career grand slam record, Roy Emerson was not considered the GOAT. Even Sampras wasn’t a slam dunk for GOAT when he owned the career grand slam record. Say Nadal wins 3 more majors – a very realistic assumption considering he’s only 27 years-old. Then he’d have 16 grand slams, an Olympic gold medal, and an even more lopsided head-to-head against Federer. At that point, it’s beyond number-counting, the same way Borg vs. Emerson is beyond number-counting. Lastly, if you lined up their careers perfectly, who’s to say Federer would have learned Nadal’s game? Sure, Nadal’s style might be particularly well formed to beat Federer, but I think Federer had plenty of time to figure out Nadal. You gotta believe Federer spent every day during ’06-’10 trying to figure out how to beat Nadal. I know my argument for Nadal is subjective because the numbers favor Federer. But in other sports with an objective GOAT, not even a subjective case can be made for anyone else. 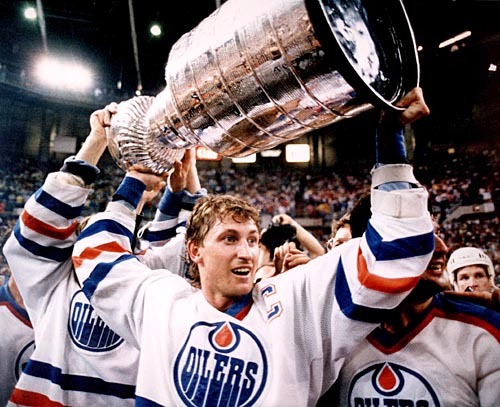 In hockey, for example, the invincibility of Gretzky’s Oilers during The Great One’s prime in conjunction with his untouchable individual records make him the most decorated valedictorian in NHL history. In addition, Gretzky was peerless for his 10+-year prime, and his status as smartest kid in the class (SKIS) was never in doubt. By contrast, in basketball, the Jordan vs. Russell debate is subjective. Russell won almost twice as many titles and individual accolades that compete with anybody’s – he is basketball’s most decorated valedictorian ever. But a contemporary of Russell, Wilt Chamberlain, boasted more impressive stats and, thus, can make a strong case for SKIS honors during Russell’s era. During Jordan’s prime, his status as SKIS was never in doubt. The Federer/Nadal case is extremely rare in sports. Usually the hairiness in the GOAT debate comes when comparing non-contemporaries, such as Russell and Jordan. But here, the generation’s two greatest players have played each other 32 times, and the one who’s widely considered the GOAT has won fewer than one-third of the confrontations. Is the rest of Federer’s resume strong enough to ignore that extremely inconvenient statistic? That’s the question, and the answer leaves plenty of room for subjectivity and debating weights of variables on the maddeningly imprecise Greatness Index. I am convinced, though, that this subjectivity would not exist if the Federer/Nadal head-to-head weren’t so lopsided. What argument could anyone make against Federer if this record were flipped? If Nadal didn’t own Federer, Federer would be considered the tennis equivalent of Wayne Gretzky. Instead, he’s tennis’ Bill Russell. In addition, Roger Federer’s elegant speed, footwork, shot selection, angle creation, looks, and personality have earned him transcendent popularity. He is a national hero in his native Switzerland – Swiss bankers pay him six figure sums to attend their parties, and many believe he’s poised for a strong career as a politician after tennis if he so desires. In 2011, Reputation Institute went as far as to name him the second most “Respected & Trusted” person in the world, behind Nelson Mandela and ahead of Bill Gates, Warren Buffett, Richard Branson, Steve Jobs, and Oprah Winfrey, respectively. In 2013, Forbes ranked an aging Roger Federer the world’s 8th most powerful celebrity and 2nd highest paid athlete. During these years, Nadal and Federer have played 2 epic matches (Wimbledon ’08 and Australia ’09); Nadal and Djokovic have played 2 (Australia ’12 and French ’13) and arguably 4 more (Olympics ’08, US Open ’10, US Open ’11, and US Open ‘13); Djokovic and Federer have played 3 (US Open ’10, French ’11, and US Open ’11); Federer and Murray have played 1 (Australia ’13) and arguably 2 more (Wimbledon ’12 and Olympics ’12); Djokovic and Murray have played 3 (Australian Open ’12, US Open ’12, and Wimbledon ’13); Del Potro and Federer have played 2 (US Open ’09 and Olympics ‘12); Del Potro and Djokovic have played 1 (French ’13); Roddick and Federer have played 1 (Wimbledon ’09); and Nadal and Verdasco have played 1 (Australia ’09); and Djokovic and Wawrinka have played one (US Open ’13). « An Assault on Vanity, by Philip S.